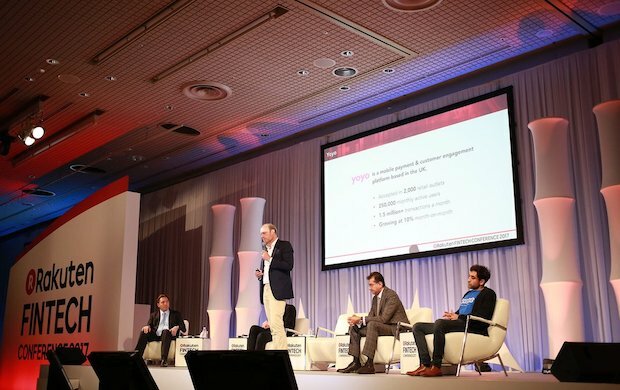 Yoyo Wallet, Europe’s fastest-growing mobile wallet provider, is mulling expansion worldwide but is in particular focused on the Asia-Pacific region, with Japan as a cornerstone. The four-year-old fintech outfit, based out of London, had just two months ago conducted its Series B fund run. Thus today Yoyo Wallet is well-funded enough to be able to find strong partners in Asia, not to mention that it could recently open a pilot base in Singapore. 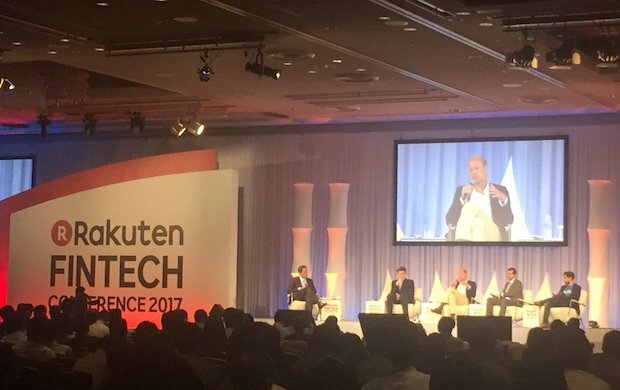 In addition, the startup has also been testing out the waters through a (still stealth-ish) New York office, so in view of fathoming the situation overseas, Yoyo Wallet’s Co-Founder and CEO Alain Falys was in Tokyo this week for the Rakuten FinTech Conference 2017; it’s worth noting that he visited Japan last year as well. Regarding the fintech conference, not only the serial entrepreneur M. Falys but also UK finance provider PremFina‘s CEO Bundeep Singh Rangar (a McGill and a Columbia School of Journalism graduate who has garnered much media attention) and blockchain-centered startup Wyre Co-Founder and CEO Michael Dunworth (an erstwhile Sydneysider fund transfers expert who is now a San Francisco entrepreneur) gathered together to discuss “Innovation in FinTech” on September 27th at the Hotel New Otani venue. 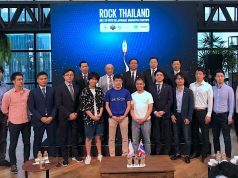 The conference also had participants like Professor Emeritus Yukio Noguchi of Hitotsubashi University [this reporter’s former fellow contributor to “BP Navigator” magazine], speaking on blockchain and the digital economy, plus other eminent persons. Returning to Yoyo Wallet, according to its CEO – who had in the past created a global electronic invoice company OB10 (now known as Tungsten Network) – it is not another “mobile wallet” app for the smartphone user but a tool for the retailer whose ePOS can become a powerful business generator when it takes advantage of the simple, quick and attractive “rail” set for them by the Yoyo Wallet platform. In a nutshell, the mobile app lets users gain “electronic point card” benefits while also letting the retailers know what kind of preferences the consumers have upon shopping. The increased incentives availed have been shown to motivate consumers into using Yoyo Wallet even more, as was borne out by the fact that the Europe-based Caffè Nero chain of 650 stores already having turned 5% of its total payment volume onto Yoyo Wallet, barely 3 months from launch. 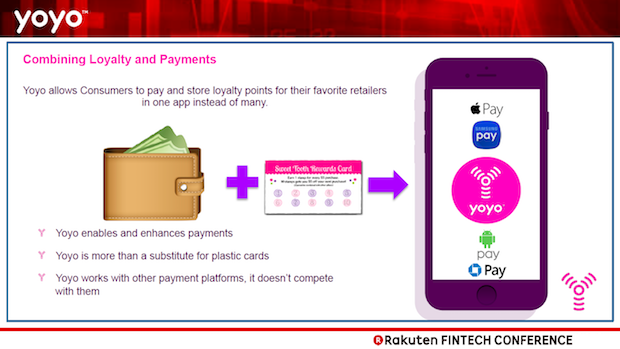 The Yoyo Wallet CEO sees their loyalty-driven set-up altering Japanese “cash-preferred” inclination which, like German buying behavior, could be changed into a digital money-oriented one where even tax invoices can be handled. 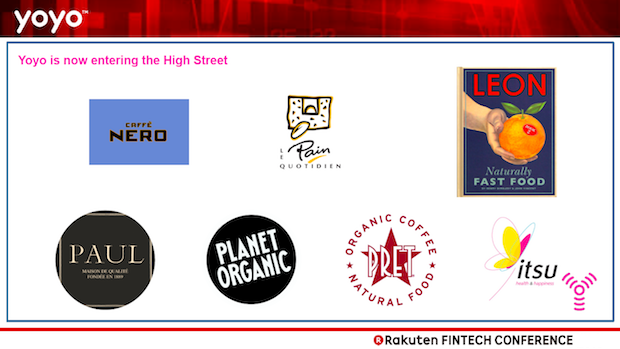 Although its business in UK was led by the university sector wherein students were the early adopters, the difference in the Japanese student canteen system and suchlike will likely mean a targeting of the retail sector for Japan. 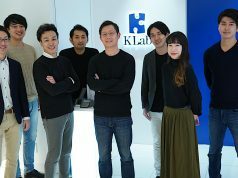 A 20% share of the mobile payment market will be aimed for once the startup gains appropriate local entities as partners. 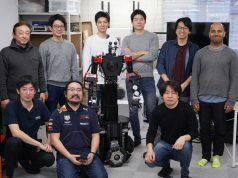 Since queries as to security and other concerns were clearly addressed by CEO Falys, I would like to wish him and his company “Bonne Chance!” in breaking into the Japanese market.